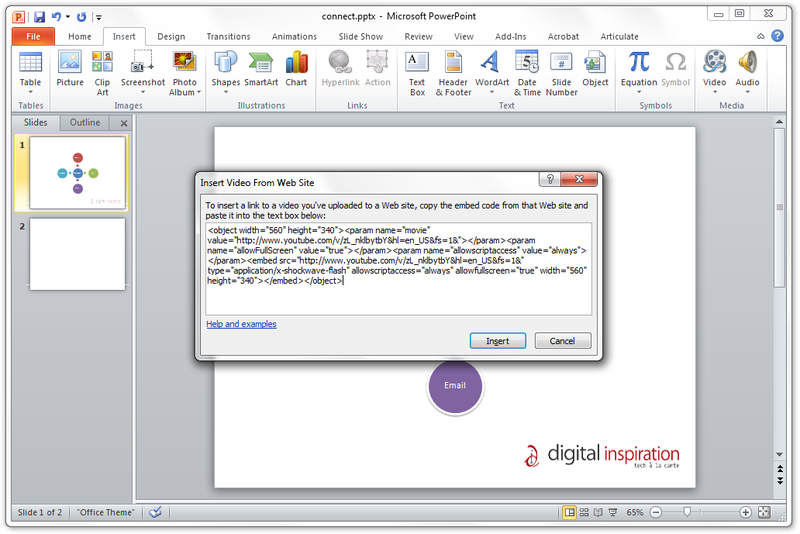 Go to the Insert tab of PowerPoint and select Video -> Insert Video from Website. Now copy-paste the Flash video* embed code into this dialog and adjust the size /location of the video clip on the PowerPoint slide using the visual handles. And it’s not just for embedding web videos in slides. You may even use the Flash embed code from Slideshare and play a web presentation inside your local presentation. Or embed an MP3 player and play streaming music from your PowerPoint presentation. [*] If you are using an older version of Office, here’s an alternate hack to Insert YouTube Videos in PowerPoint Presentations.